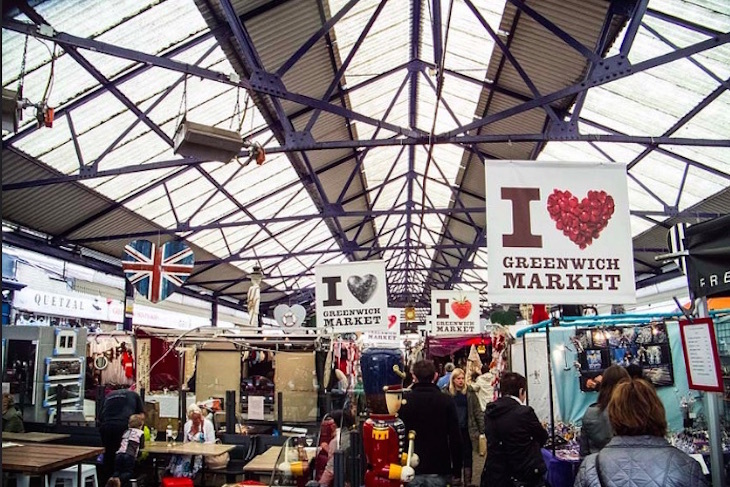 London has markets that cater for just about everything, from fresh produce to antiques to second-hand clothes and many items in between. They can be located within their own buildings or along streets, and are to be found all over the city. Looking into where their names come from throws up all sorts of stories about London’s past, real and imagined (medieval religious establishments, mythical kings) as well as thoughts of places in other parts of the country, and indeed much further afield. 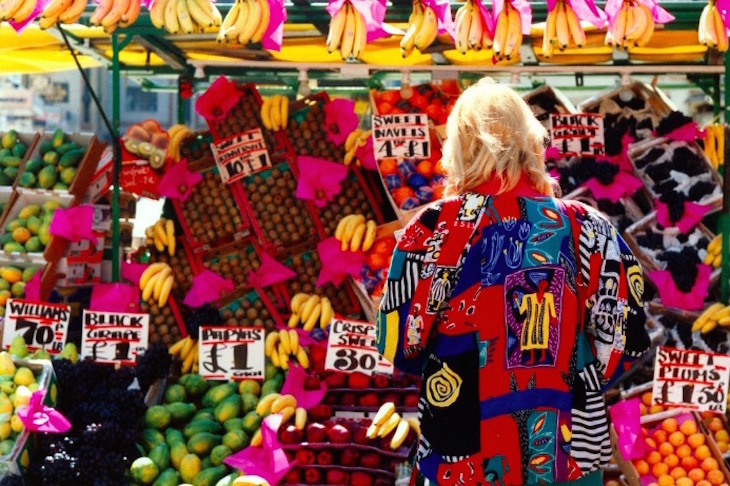 “Never ever have I seen anything quite so stunningly beautiful as the rotting fruit and vegetables in Berwick Street Market”, wrote the (usually sozzled) journalist Jeffrey Bernard. This Soho street market dates back to the 18th century, although it wasn’t officially recognised until 1892. The street itself was built between 1687 and 1703 and was named after James FitzJames, the illegitimate son of King James II who was ennobled as the Duke of Berwick. The title refers to the town in Northumberland; the name derives from the Old English bere (barley) and wic (farm or settlement). Britain’s largest wholesale fish market started as a general market in the Middle Ages, becoming a “free and open market for all sorts of fish whatsoever” in 1699. It is named after the City Ward of Billingsgate in which the market was originally located (it moved to Poplar in 1982; the Old Billingsgate Market building is now a hospitality and events venue). Billingsgate is believed to have been the site of London’s original water gate – a fortified gateway leading onto a quay or wharf. The 16th century antiquarian and historian John Stow reckoned that it was named after “some owner of the place, happily called Beling or Biling”, although the 12th century cleric and historian Geoffrey of Monmouth claimed that it was named for Belinus, a mythical king of pre-Roman Britain. One of London’s oldest markets, this wholesale and retail food market celebrated its 1,000th birthday in 2014 (it claims to have existed since 1014, although the earliest recording of it dates back to 1276). The name comes from the word for a local government unit that originated as a burh – a fortification or fortified settlement developed in Alfred the Great’s time to defend against the Vikings. The one at the southern end of London bridge was called Southwark although for many years it was simply known as ‘the Borough’, similar to how the City of London is still sometimes referred to as ‘the City’. 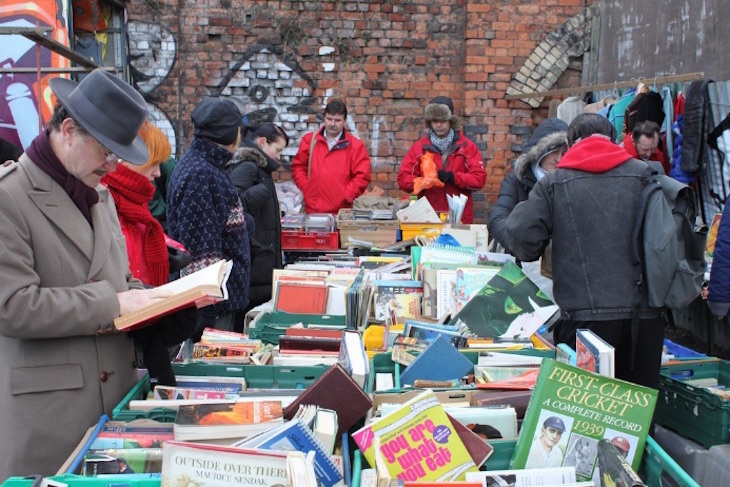 Popular with bargain hunters looking for just about anything and photographers wishing to take pictures of unusual items, Brick Lane Market has its origins in the Jewish community which used to live in the area (which is why the market is held on Sundays). Formerly called Whitechapel Lane, the street’s current name dates back to when the area became known for the manufacturing of bricks and tiles. There has been a market at Brixton since the 1870s, beginning under the railway arches and later spreading along Electric Avenue. The name was recorded in 1067 as Brixistane, meaning the stone of Brixi or Brihtsige – a Saxon lord who is thought to have erected a boundary stone somewhere in the area to mark the meeting-place for the men of what became the hundred (district) of Brixton in the county of Surrey. This is the name of the Hackney street, formerly part of an old drovers’ road, which runs between London Fields and Regent’s Canal, on which the market is located. Established as a fruit and vegetable market in the 1890s, it slowly dwindled over time before being revived as a Saturday-only food market in 2004. Its subsequent development has raised concerns about the gentrification of the surrounding area. A fairly common British street name, ‘Broadway’ comes from the Old English words brad (broad or wide) and weg (road). This dates back to the mid-1970s when what was intended as a temporary market was established on a site previously occupied by warehouses associated with the adjacent Regent’s Canal. The nearby lock on the canal, a twin lock constructed in 1818-20, is actually called the Hampstead Road Lock although it is popularly known as Camden Lock. Camden is named after the lawyer and politician Charles Pratt, the Earl of Camden, a local landowner who developed the area in the 1790s. His title derived from Camden Place in Kent, which was named for a previous owner – the 16th century historian William Camden. 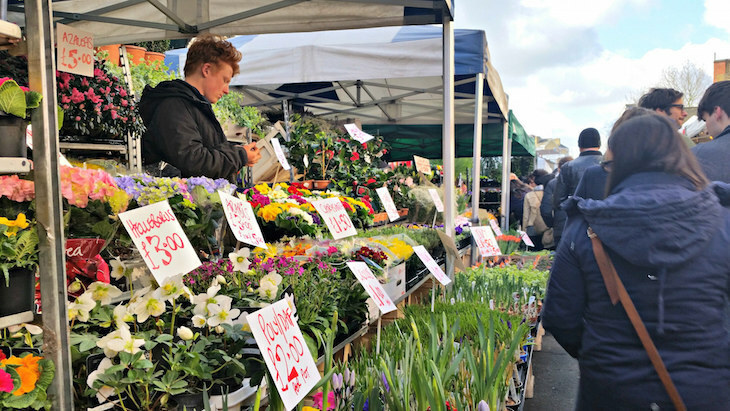 The Sunday flower market is the successor to Columbia Market, a short-lived (1869-86) covered food market established by the nineteenth-century philanthropist Angela Burdett-Coutts, a lady described by Edward VII as “after my mother, the most remarkable woman in the kingdom”. The name originated from her. Prior to her attempt to establish a new market in the East End, she had founded a bishopric in British Columbia. A province of Canada since 1871, it had previously been a British colony which was named after the Columbia River which rises in the Rocky Mountains and flows into the Pacific Ocean. The old fruit and vegetable wholesale market dates back to the 17th century – the first record of a market here is from 1654, and Charles II granted a charter for it in 1670. The name is older – the land was owned by Westminster Abbey during the Middle Ages, and was referred to as “the garden of the Abbot and Convent of Westminster” in the thirteenth century. The name Covent Garden (‘covent’ being a corruption of ‘convent’) had evolved by the sixteenth century. The market relocated to Nine Elms in 1974. 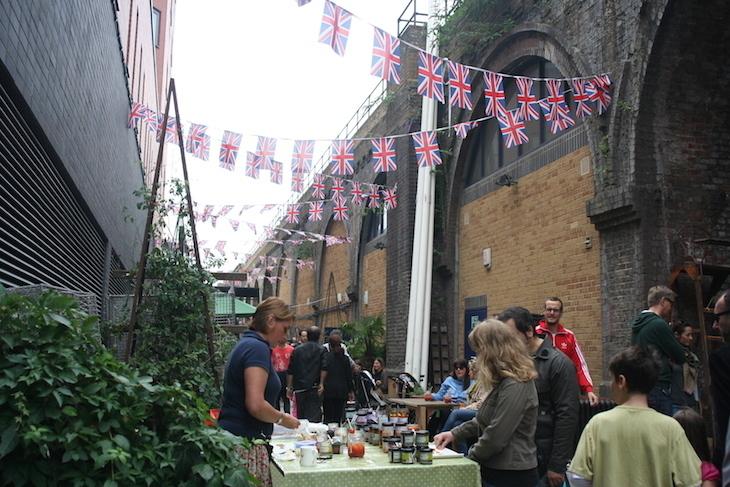 As with Broadway Market, Exmouth Market is the name of the street on which the market has been held since the 1890s. Located in Clerkenwell, it is named after the Exmouth Arms pub, which was named in honour of Admiral Sir Edward Pellew, a naval officer who was ennobled as Lord Exmouth in 1814 (and who appears in some of the Hornblower novels as the hero’s commanding officer). He took his title from the seaside town in Devon which is located at the mouth of the River Exe. There has been a market here since the 14th century, although a charter wasn’t granted until 1700. Nowadays, it’s not so much one market as several that offer different things on different days of the week, Sunday being the only day on which all parts are open for business. The name comes from the Anglo-Saxon ‘Grenewic’, meaning ‘green port or harbour’. This covered market on Gracechurch Street dates back to the 14th century, although the current building is from 1881. Back in the Middle Ages, foreigners – defined in this case as anyone from outside London – were allowed to sell poultry, cheese and butter here. It, and nearby Leadenhall Street, are named for a lead-roofed mansion that stood in the area in the fourteenth century. 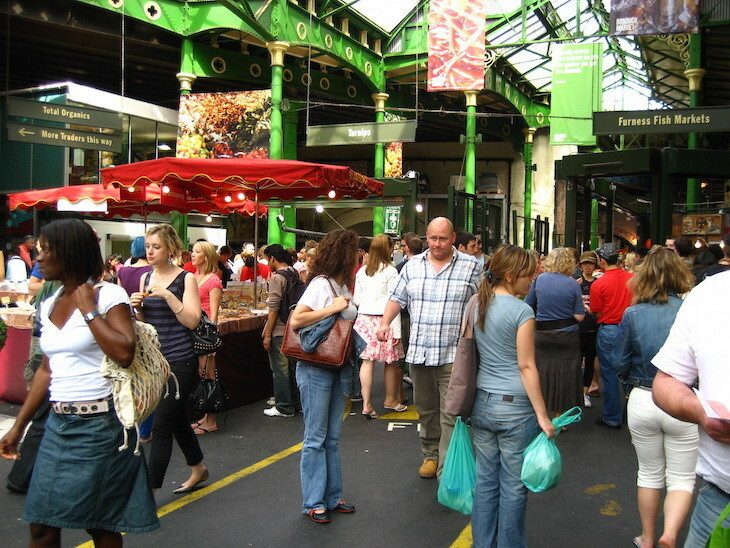 Established in 1999, this organisation currently operates some twenty farmers’ markets in the Greater London area. A farmers’ market is a market where the vendors must raise, grow or bake everything they sell (no middlemen are allowed), and for the London ones the produce must come from within a hundred miles of the M25. The various origins of the name ‘London’ is, of course, a topic that Londonist has looked into before. More an informal community of food and drink purveyors underneath the railway arches than a market as such, this new venture began in 2010 when Monmouth Coffee opened up its roastery on said street in Bermondsey. Various traders followed and Maltby Street became a word-of-mouth hit among foodies put off by the crowds at Borough Market; the food writer Nigel Slater has described it as “a slightly secret and hidden place, where supply goes with the ebb and flow of the seasons, where there is a constantly evolving group of traders”. The name ‘Maltby’ is of Norse origin, deriving from malti (sharp or bitter) and byr (farm or settlement), and there are places of that name in North Yorkshire, South Yorkshire and Lincolnshire. This market, which was largely unregulated until the 1930s, is situated on and around the boundary between the City of London and Whitechapel; the part on Middlesex Street is Sunday-only but the bit on Wentworth Street is open six days a week. The former was originally called Hog’s Lane, but was recorded as being called ‘Peticote Lane’ from the early 17th century onwards, originally deriving from the sale of second-hand clothes that took place there but later reflecting the area’s status as a district where clothes were manufactured and sold. Although Petticoat Lane officially became Middlesex Street in 1830, the old name is still widely used. 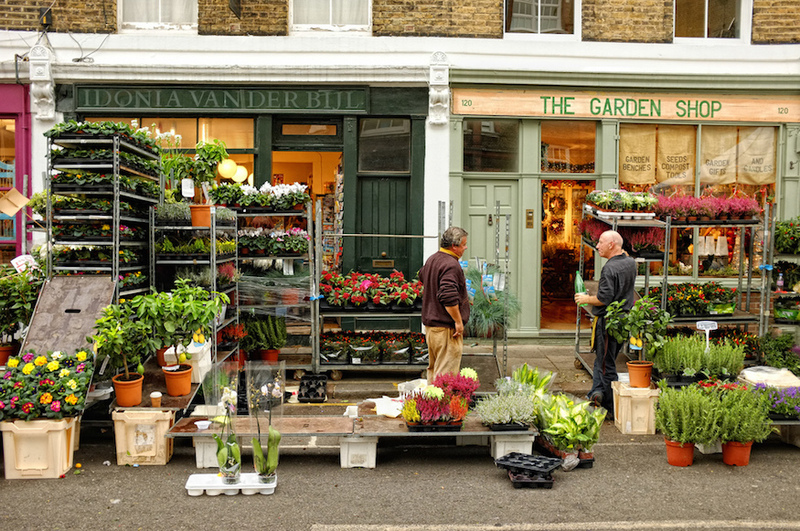 This market in Notting Hill began as a food market in the 19th century, with the antique dealers moving in in the 1940s and 1950s. The street on which it is situated used to be called Green’s Lane, but in 1740 it was renamed in honour of Admiral Edward Vernon’s victory over the Spanish at Porto Bello (located in modern-day Panama) the previous year – an event which also led to districts in Dublin and Edinburgh acquiring the name of Portobello. The name, said to have been coined by Christopher Colombus, means ‘beautiful port’. The market at Shepherd’s Bush opened for business in 1914, on a site originally intended to be an access road to the tube station which has been named after the market since 2008 (this was done in order to avoid confusion with the nearby Central line and Overground stations, both of which are called Shepherd’s Bush). There are two theories as to how Shepherd’s Bush got its name – it either comes from the surname of someone who used to own the land, or from the shepherds who used the common land in these parts as a resting-point for their flocks on the way to Smithfield Market. Meat has been traded at Smithfield for centuries, with a livestock market having occupied the site since the 10th century. 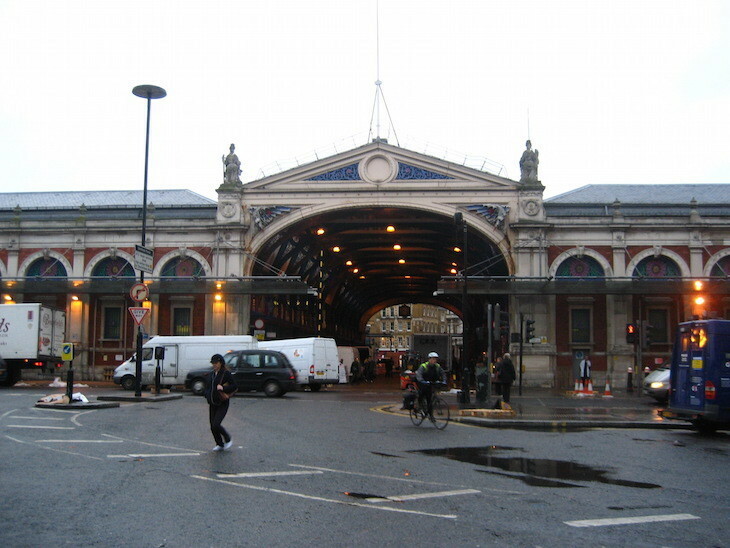 Today, Smithfield – officially known as London Central Markets – is the last of London’s great wholesale markets that is still located within the City of London. The name derives from ‘smooth field’, as seen in the 12th century cleric William Fitzstephen’s description of it as “a smooth field where every Friday there is a celebrated rendezvous of fine horses to be traded”; as a convenient open space on the outskirts of the City, it was also used for tournaments, jousting, public executions and – from 1123 to 1855 – the riotous Bartholomew Fair. The current market hall dates from 1868, with extensions added in 1875 and 1899. The market here was established in 1682 and specialised in fruit and vegetables; it moved out to Leyton in 1991. The old market building is now host to a thriving general market which is open seven days a week. The land, recorded as ‘the spitel fyeld’ in 1561, belonged to a medieval priory called the New Hospital of St Mary without Bishopsgate, usually shortened to St Mary Spital. It was closed during the Reformation; Spital Square marks the spot on which it stood. 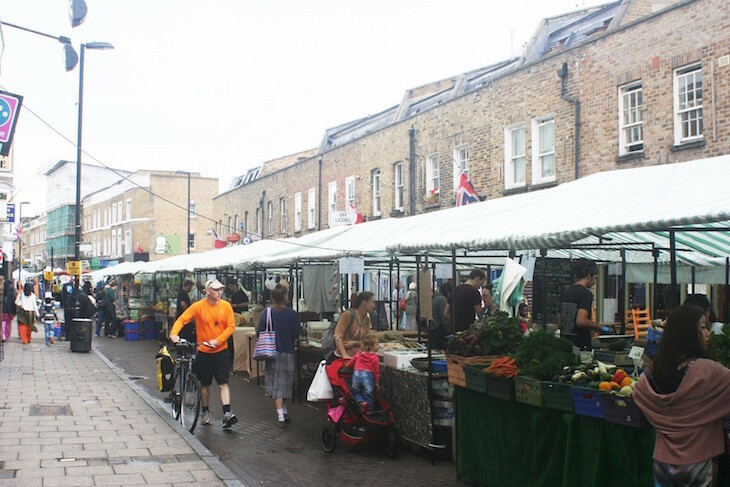 Famous for being the longest street market in Europe, this market dates back to 1885 and runs along Walthamstow’s High Street for five days a week (Tuesday to Saturday). The name, which was recorded as ‘Wilcumestou’ in the Domesday Book, means ‘place of welcome’; somewhat surprisingly, it does not appear to be connected with Waltham Abbey in Essex. See also: the rest of our etymology series, including how London's alleyways, squares, castles, palaces and football teams got their names.